Increase the output of DC pumps with our 6 Amp mini-maximiser kit. This device allows you to drive pumps and other motor driven devices directly from a solar panel or panels, without the need for batteries. When used with pumps, the mini-maximiser can provide up to 40% more pumping per day. Note: This kit is not designed for use as a battery charger, and must only be used with solar panels and motors/pumps. A suitable case might be a HB6213 or HB6123 Plastic case rated to IP65 available from Jaycar. 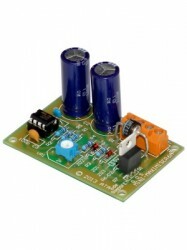 Note: The kit is supplied with the components to build either the 12 or 24 volt version. Please refer to the enclosed instructions for further details. Please also note that no case is provided.